XL600 Dual Carb, originally uploaded by evanfell. There was only one time during all the miles I put on my XL600 that it wouldn’t start. I ended up pushing it 6 miles back home through the hills. The bike had been running a bit strange for a few days, but it had never once let me down. I came out of a restuarant and it simply wouldn’t fire up, not even a puff. This was a very out of the ordinary problem for me. Typically when a bike doesn’t start the first thing I check is spark. It is extremely rare for carburetors to work fine one minute and fail to such an extreme the next. My first thought was a spark issue. Old Honda singles are known to have stator issues over time. Unfortunately riding such a reliable bike broke my normal habits over time and I was no longer carrying a tool kit with me. So I had no way to pull the plug and check for spark, nor did I have a spare plug anyway. So I began pushing. After an incredibly exhausting few hours of pushing the bike through the hills I got back to the garage. First thing I did was pull the plug and I noticed right away the plug wire cap felt loose. I pulled the cap off the wire, trimmed the wire back half an inch, and screwed it back in. I was sure I had found the culprit. I was wrong. I had spark the whole time. Next I turned my attention to the carbs and immediately saw the problem. 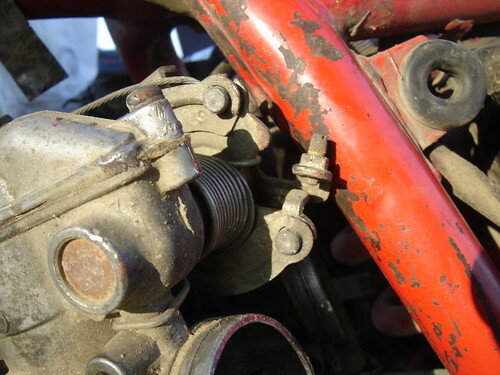 The tabs in the picture are used to adjust sychronization between the two carburetors. The tab on top had become quite bent gradually over time. Eventually it bent to the point where it got hung up on the rear shock spring. The right carburetor was stuck open preventing the fuel/air mixture in the cylinder from being adequate for the bike to start. I pulled the carbs and did a thorough adjustment, and in 30 minutes the bike was purring better than it ever had.